Niccoló Machiavelli (1469-1527) created a whole new field of study that we now call political science. He and his best friend Francesco Guicciardini together wrote the first studies of political action that subjected these actions to careful “scientific” study in an attempt to study the political field of human action in a calm and dispassionate way, isolated from the usual religious and national prejudices. No one had ever thought this way; no one had ever written in this way. It was new; It was modern. One book above all made him famous: The Prince. The most powerful man in the world, Emperor Charles V, had three books on his bedside table: The Bible,The Courtier, and The Prince. (April) Nine-year-old Niccoló watches as the city of Florence collapses into chaos in the wake of the Pazzi Conspiracy, an attempt to assassinate Lorenzo and Giuliano de' Medici and overthrow the Medici as leaders of the government of Florence. Lorenzo survives and leads the city for the next fourteen years. (April 9) Death of Lorenzo de' Medici. The passing of Lorenzo marks the end of an era. It is the end of the leadership of the Medici family in Florence within a republican constitution. Within two years the whole family will be out of Florence and out of power. (Aug 11) Election of Rodrigo Borgia as Pope. Takes the name of Alexander VI. This begins an eleven-year era of Borgia control in Rome and central Italy which will determine every diplomatic move of the Republic of Florence. (Sept) The French Invasion of Italy begins with the arrival of King Charles VIII at Turin. Charles and his huge army move south. Florence which has failed to negotiate an agreement with Charles is in grave danger. (Nov 9) Piero de' Medici (son of Lorenzo) tries to arrange an agreement with King Charles, but when he returns to Florence the city turns on the Medici family. Piero and his brother Giovanni (the future Pope Leo X) are forced to flee the city in the middle of the night. The mutual agreement between the Medici family and the Republic of Florence is over and in the future, Medici control in Florence will be reasserted only at the head of a foreign army. (Nov 17) King Charles VIII of France enters Florence with thousands of troops. The conquered city is forced to host the army in its palaces. One wit said, "Charles conquered Florence with a piece of chalk," referring to the quartermaster's chalk that marked the handsome Florentine palazzi that would be taken over by the French troops. Niccoló Machiavelli, now twenty-five years old, watches consumed with shame as the thousands of French troops march into his city and pass his house. (Jan 1) New democratically elected government of Florence takes office. Beginning of the power of Savonarola within this essentially democratic government. All the Medici and their allies have been exiled or excluded. Thus the great aristocratic families are enemies of this broad-based pro-Savonarola government. Machiavelli knows Savonarola and is not an admirer of the Dominican preacher's theocratic governmental ideas. (Feb) King Charles enters Naples. As of February, he has been able to move all the way down the peninsula with almost no opposition. Italy looks weak and disunited. Now a new alliance called the Holy League (that name will be used again so be careful when you see it: The Holy League Holy League of 1495) forms between the Pope, Milan, Venice and Spain to drive the French out of Italy. (July 6) Battle of Fornovo near Modena. The vast forces of almost all of Italy engage the French army at Fornovo in an attempt to destroy the power of King Charles VIII. The leader of the Italian forces is Francesco Gonzaga from Mantua, husband of Isabella d'Este. The Italians fail to unite their forces (a kind of symbol of their behavior during the whole previous year) and the French successfully withdraw north to fight another day. The lesson for Machiavelli is: Italian disunity aids the enemy. (Feb 11) Savonarola resumes preaching in Florence in the Duomo in defiance of the papal prohibition. Florence and Rome are now on a collision course and Florentine opinion begins to back away from Savonarola as the consequences become more and more clear. (Mar 18) Savonarola preaches his last sermon. (Apr 7) Followers of Savonarola undergo trial by fire as a test of the truth of his preaching. Opinion in Florence turning rapidly against him. (Apr 7) On the same day as the ordeal in Florence, the King of France dies unexpectedly Charles VIII is gone from the scene and is succeeded by his cousin Louis XII. Louis even more interested in Italy than Charles had been. (May 22) Savonarola Executed along with two of his followers in the Piazza Signoria by hanging and then the corpses are burnt and the ashes are strewn over the waters of the Arno. This public execution of a political leader is a rare event in Florentine history and remains a frightening reminder of crowd psychology and mass hysteria. Observers like Machiavelli find the whole episode embarrassing for Florence. 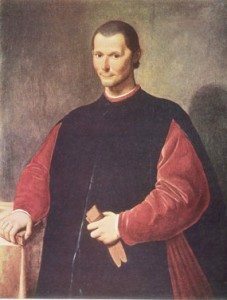 (June 16) Machiavelli appointed to the government of the Signoria (the governing council of Florence) as head of the Second Chancery and also as secretary to The Ten of War, the Florentine office that controlled Florentine military matters. Machiavelli is sent immediately as ambassador to the government of Caterina Sforza in the small city of Forlí and Imola. These were very important cities for Florence since they formed a northern barrier along the Apennines for the Florence territory. The Borgias and especially Cesare were looking at Forlí as a potential state for the stateless Borgia children. Cesare Borgia beginning to build a papal state along the coast and the Apennines north of Florence. This is dangerous for Florence and soon Machiavelli will be sent to deal with Cesare. (Aug-Oct) King Louis XII enters Italy with army and takes Milan. Ludovico Sforza flees to the north. And although he briefly returns to power for a matter of days, the French now control Milan and much surrounding territory for the next decade (to the Battle of Ravenna). Ludovico is carried off to a French dungeon where he spends the rest of his life in hideous isolation. His story remains one of the great tragedies of the Renaissance and all Italians are shocked at the treatment given him by the King of France even if many thought that Ludovico had brought trouble upon himself when he cooperated with the first French invasion of 1494. As one advisor told him: "You are bringing in a lion to catch a mouse." (Aug-Dec) Machiavelli travels to France to represent Florence before the court of King Louis XII. Machiavelli comes to know Louis well and gathers solid understanding of the international situation. He is shocked to discover that Florence is now viewed in the French court as irrelevant to power in Italy. This insight gives him unique understanding of the situation for Florence and now he will have to argue with his fellow governors in Florence to try to convince them that Florence is no longer the power that she was before 1494 and the fall of the Medici. (Nov 11) Treaty of Granada, a secret treaty, signed between Louis XII and King Ferdinand of Spain in which the two monarchs agree to divide Italy between them. Spain will get the south (Sicily and Naples) France will get the north. After a few more battles, the two monarchs settle into their two spheres of influence. (Jan) Machiavelli back in Florence working in the Chancery and enjoying his friends. (Feb) Machiavelli travels to nearby Pistoia to assess Florence's allies to the northwest. Machiavelli goes to Siena as Florentine ambassador to government of Pandolfo Petrucci as the threat of Cesare Borgia grows in central Italy. In Florence, the Signoria approves legislation to institute the position of Gonfaloniere (the CEO of the Florentine state) as position with lifetime tenure. Machiavelli's good friend Piero Soderini is appointed to this position. It is Soderini who protects Machiavelli in his government job right to the end of the Soderini regime (1512). (June) Cesare Borgia completes a lightning quick invasion and conquest of the strategic city-state of Urbino. All Italy is shocked. Urbino was supposed to be an ally of the pope. Now it seemed that no friend of Pope Alexander VI was safe. Anything and anyone would be sacrificed (maybe even Florence!) in order to build a state for his son Cesare. (June) Machiavelli arrives in Urbino to meet Cesare for the first time. This is one of the great encounters in history since it is during his days with Cesare that Machiavelli forms many of the ideas he will write down ten years later in his book The Prince. One can understand why Machiavelli was impressed with this ruthless twenty-seven year old prince of the Borgia family. Here was Cesare, so recently a nobody, now ruler of a growing state bordering Florentine territories. The roads were filling with the petty tyrants of small states, now wandering homeless and lamenting the unprincipled actions of this papal son. Machiavelli met Cesare in the spectacular rooms of the ducal palace of Urbino. Machiavelli now saw Cesare up close: tall, handsome, brilliant, with his shoulder-length coal black hair giving him the aura of some superhuman ancient Greek hero. (Dec) The Massacre at Sinigaglia. Cesare Borgia lures a group of petty tyrants to a peace meeting at Sinigaglia and then has them all strangled. So much for peace! (Aug) Death of Pope Alexander VI in Rome and the whole Borgia empire collapses. Cesare is outmaneuvered by the newly elected Pope Julius II (Della Rovere). (Oct) Florence sends Machiavelli to Rome to meet with the new pope. These recent events add to the material Machiavelli is collecting for his book on government. The totally unexpected events of the last months now provide more material for Machiavelli's book on government. Cesare Borgia's fall had been as rapid his ascent. Machiavelli travels to Perugia and Siena to assess the situation for Florence as Pope Julius prepares to reconquer "papal" territory. Florence worries even though she has long history as papal ally. Machiavelli begins plans for his citizen militia. This is one of his most cherished ideas of governmental reform: that the Republic should rely not on paid mercenaries but instead on its own well-trained citizens in a citizen militia. He writes his ideas in a book On the Art of War. Pope Julius II begins his War in Central Italy to take back papal territory. Florence sends Machiavelli to meet with the pope in Perugia. Thus once again, Machiavelli is right in the middle of the action as the Pope enters Perugia without his army, daring his enemies to strike him down. Machiavelli is impressed by this scene and writes about it and the papal calculations that went into it. At this point, Machiavelli's diplomatic experience has given him an unrivaled knowledge of the leaders of the first decade of the 16th century. He has known almost every one of them personally. (Feb) Machiavelli present at the siege of Pisa hoping to put his millitary ideas into effect. Pope Julius II established the League of Cambrai with Spain, France and the Holy Roman Empire ( Maximilian in Germany) against Venice. Venice defeated by this alliance at the Battle of Agnadello the next year. Now that he has tamed Venice, the pope will turn on France. (April 11) Battle of Ravenna. A truly historic battle in which the history of Italy is changed. The French led by Gaston de Foix fight almost everyone else near Ravenna. After a long battle involving tens of thousands of troops on both sides France "wins" but in the battle the French commander Gaston is killed and the order and unity of the army falls apart. Soon France is forced to withdraw from northern Italy. Massimiliano Sforza (Ludovico's son) returns to Milan (with Spanish blessing and oversight). (August) The allies meet at The Congress of Mantua and decide the fate of all regimes in Italy. Giovanni de' Medici gets the pope's agreement to the return of the Medici to Florence with Spanish troops leading the family back to power. These 6,000 troops move south through the Apennines to the south side where they rested at Prato, a Florentine ally. The commander asks Florentine cooperation in a peaceful return of the Medici to Florence. Piero Soderini leads the democratic forces in a rejection. The troops at Prato go out of control of their commanders and run wild sacking the whole city of Prato. More than 4,000 people are slaughtered. The minute that Florentines can reach their city to report the sack, Florence resistance to the return of the Medici collapses, and Piero Soderini is thrown out of power. He sneaks out of the city under protection of darkness exactly the way the Medici had done eighteen years before. (August 31) The Medici Return to Florence. The republic is at an end. Now Medici functionaries will rule the city for an absent Medici pope in Rome for the next fifteen years. (Nov 7) Niccoló Machiavelli is fired from his post as Secretary. He is now out of his government job and never gets back in. The Medici see him as an intimate of Piero Soderini and therefore not to be trusted. (Feb 19) Machiavelli is arrested by the pro-Medici government of Florence, imprisoned and tortured. (Feb 21) Death of Pope Julius II in Rome. (March 11) Election of Giovanni de' Medici as Pope Leo X. Now the Medici will rule from Rome, reaching back to their home base in Florence and controlling every move of the Florentine government. This new Medici rule in Florence is totally different than the one operated by Lorenzo de' Medici. Now the Medici are back in Florence with the help of foreign troops. There is a great deal of dissension and anti-Medici feeling on the part of republican circles and within those circles Machiavelli is one of the most prominent leaders. (March 13) Machiavelli is freed from prison and exiled to his country house in Sant' Andrea in Persussina in the hills south of Florence. Here is where he spends most of the rest of his life (to 1527). Much of his time he uses writing. (Dec 10) Machiavelli writes to his friend Francesco Vettori that he has completed a book on government called The Prince. (Jan 1) King Louis XII dies and is succeeded by Francis I. (Sept 13) Battle of Marignano. The French, led by a vigorous, young King Francis I, return to Italy and reconquer northern Italy at this battle. French defeat a coalition of papal and imperial troops. Now once again, Italy will be the scene of an international duel between the aggressive new king of France and the vigorous new king of Spain. For the next ten years, Italy will be torn apart as these two battle for control of the whole of the Mediterranean. (Dec 17) Concordat of Bologna. Pope Leo X meets King Francis I of France and signs a concord between the papacy and France that addresses payment of fees to Rome and other issues. The papacy will now be caught up in this duel between France and Spain as both attempt to coerce the pope into supporting their claims to Italy and other holdings. Both Pope Leo X and his successor Pope Clement VII attempt to walk a tightrope between the two powers. (Jan 23) King Ferdinand of Spain dies and is succeeded by his grandson Charles V. This is the time of the passing of the whole generation that has dominated Italy in the last years of the 15th century and the first years of the 16th century: King Charles VIII, King Louis XII, Ferdinand and Isabella, Pope Alexander VI and Pope Julius II, Emperor Maximilian, Henry VII of England. (March 18) Pope Leo's brother Giuliano de' Medici (called the Duke of Nemours) dies unexpectedly in Fiesole thus complicating all the Medici plans for a rule in central Italy. (June) With Giuliano dead, Pope Leo turns to his nephew Lorenzo de' Medici, the son of his brother Piero who had lost the Medici rule in the debacle of 1494, and now gives Lorenzo papal troops to take Urbino for a new larger Medici state. (Thus the Medici pope repeats exactly the action of his Borgia predecessor who had handed Urbino to his son Cesare). This Lorenzo de' Medici is the person to whom Machiavelli dedicates his book The Prince in an attempt to win the favor of the Medici. This change of loyalties by the old republican has received severe censure by later historians who find it embarrassing that Machiavelli seemed willing to do anything to return to government. But by 1516 it was clear that Florence would remain in the hands of the Medici and Machiavelli concluded that he had no other choice. In Casatico near Mantua, Baldassare Castiglione completes his The Book of the Courtier based on conversations held at Urbino. (May 4) Death of Lorenzo de' Medici, thus once again the papal plans for a Medici state in central Italy is ruined by the unexpected death of the young ruler. (June 28) Election of Charles V, King of Spain as Holy Roman Emperor. This is one of the most important political events of the early 16th century. Charles had a strong claim to the imperial throne as a direct descendent of the recently deceased Maximilian, his grandfather. Therefore, when the Electors met, they were besieged by Spanish bribes of unbelievable proportions fueled by American gold, and by counterclaims by every other ruler in Europe determined to stop this joining of Spanish power to the imperial power. The anti-Charles forces failed and on June 28 he became both Holy Roman Emperor (Germany) and continued as King of Spain. He will hold this duel power until the 1550's when he tires and abdicates in favor of his son and brother. This election has important repercussions for Italy. It means that the balance of power among those states fighting for predominance in Italy has suddenly shifted in favor of this new Spanish-Imperial power and any smart Italian leader should have understood that France was finished in Italy and that the future in the peninsula would be heavily influenced by this new international government in Madrid. (April 6, Good Friday) Death of Raphael. Pope Leo "is sunk in measure less grief." Obervers see this unexpected death of the most popular artist of the papacy of Leo as a sign of darker events to come. Leo is profoundly affected. The Lutheran movement is out of control in Germany and suddenly Leo's whole papacy looks like a disaster. (Nov 19) Election of second Medici pope, Giulio de' Medici, illegitimate son of the brother of Lorenzo de' Medici, the handsome brother who had been murdered in the Pazzi conspiracy in 1478. Giulio now becomes Pope Clement VII and begins what was one of the most disastrous papacies in all of the history of the church. (Feb 24) Battle of Pavia. One of the largest battles fought in Renaissance Italy involving more than 50,000 troops. The Spanish-Imperial forces win a total victory. The King of France is captured and carried off to a luxurious imprisonment in Spain. King Charles of Spain is now the unquestioned champion in Italy. Pope Clement VII is now caught. International forces are all converging upon him both in military and diplomatic forms. King Henry VIII of England is demanding a divorce. The King of Spain is warning the pope not to do it: Catherine of Aragon is his beloved aunt. Pope Clement VII, dabbles with a French alliance as he faces the terrible truth that Spanish-Imperial power has him boxed in. King Charles of Spain sends his forces south. (May ) Sack of Rome. Spanish-Imperial troops surrounding Rome let by Charles, Duke of Bourbon invade the Holy City and carry out the most destructive sack in the whole history of the city. For weeks, Romans cower inside huge palaces that can withstand the assaults of the rioting troops. This was exactly what everyone had warned about. This was the climax of years and years of Italian vulnerability now demonstrated to the world. The commander, Duke of Bourbon, is shot in the first minutes of the assault on the western walls of Rome by Benvenuto Cellini. Poor Machiavelli, who more than anyone else, had warned of this exact danger, lived just long enough to hear the terrible tales of the Sack of Rome. He died on June 22, 1527, at Sant'Andrea in Percussina. The literature on Machiavelli is enormous. He remains to this day one of the most controversial writers in the Western tradition and therefore numerous publications about him continue to appear every year. In the notes below, I will call to your attention just a few books that may help you to continue your studies on Machiavelli. There are hundreds of editions of The Princeand therefore you can easily choose one based on price and availability. The Penguin Classics edition seems good to me. One that I do not recommend is the one that has received much recent praise and this is the new translation by Harvey Mansfield and published by the University of Chicago Press to much acclaim. I do not like it. Mansfield chooses to translate the book with an overly literal choice of English and the result is that it is just misleading on some occasions. For example, on the first page of The Prince Machiavelli uses the word “imperio” and Mansfield translates it as “empire.” This is ludicrous. Machiavelli means “power” when he uses his Italian word whereas empire in American English means a large international state. So as far as I am concerned, a translation that starts off on the first page misleading the American reader is a waste of everybody’s time. The best edition of The Prince is a dual-language edition with Italian on one page and an English translation on the facing page. Such an edition was published in 1964 by St Martin’s Press with an excellent translation by the great American expert on Italian, Mark Musa. Unfortunately that edition is now out of print but you can find copies still out there using Bookfinder.com. The Letters of Machiavelli, A Selection. Edited and translated by Allan Gilbert. First published in 1961, University of Chicago Press paperback edition, 1988. One of the best ways to know Machiavelli is to read his letters and this wonderful collection by Allan Gilbert is an excellent place to begin. Gilbert has provided a very helpful introduction and other editorial aids. 3. Machiavelli’s History of Florence. Machiavelli’s book on the history of Florence was one of the most influential works of history in the early modern world. His book influenced all other later historians and created a model for modern, critical history. Normally this book is entitled in English, The History of Florence, in the newest and most acclaimed translation published by Princeton, the translators give it the plural title Florentine Histories as it is in Machiavelli’s Italian. Florentine Histories. Translated by Laura Banfield and Harvey Mansfield, Jr. Princeton: Princeton University Press, 1988. Ridolfi, Roberto. The Life of Niccoló Machiavelli. Translated from the Italian by Cecil Grayson. The Ridolfi biography published in the 1960’s is the father of all other contemporary biographies. Ridolfi was a brilliant Florentine patrician from a family that was active in politics in the days of Machiavelli and he invested his scholarship with the energy of a proud Florentine patriot. He also wrote equally fine biographies of Guicciardini and Savonarola. De Grazia, Sebastian. Machiavelli in Hell. New York: Farrar, Straus, & Giroux, 2000. This new biography of Machiavelli was first published in Italy in 1998 and then a translation was published here in the USA in 2000 and now we have a paperback edition out in 2002. I recommend it to you highly. Viroli has done something that no other biographer has done: he has created a likable, witty, fun, interesting whole human being who loved his friends, loved his city, loved his wife. It is a wonderful biography and a totally delightful reading experience. Although De Grazia has written a bigger book, Viroli gives you an unforgettable character whom you can like. The politics and diplomacy are brilliantly portrayed and the book is an excellent introduction to the complicated politics of early sixteenth-century Italy. There are a number of influential studies of various aspects of Machiavelli’s life and works. Unfortunately, many of them are out of print and therefore you need to use the library or an online search website such as Bookfinder.com. Here below I will list just a few of my favorites on Machiavelli. Chabod, Federico. Machiavelli and the Renaissance. Cambridge, Mass: Havard University Press, 1958. Reprinted as a Harper Torchbook in 1965. Politics and History in Sixteenth-Century Florence. Paperback edition from Norton in 1984. Now out of print but there are many used copies out there. This book by Felix Gilbert which he wrote while he was in residence at the Institute for Advanced Study at Princeton, is one of the greatest studies of the interchange between politics and history that has ever been written. Gilbert immersed himself in the details of the politics of Florence at the end of the fifteenth century and the beginning of the sixteenth century, and then he turned to the great histories of Florence written by Machiavelli and Guicciardini and tried to show how exactly the politics influenced the writing of history. It is one of the best books written on the Renaissance. Hale, J. R. Machiavelli and Renaissance Italy. Originally published in England in the Teach Yourself History series edited by A. L. Rowse, this book was then reprinted in the USA by Collier books paperbacks n 1963. It is now out of print but there are many used paperback copies and Amazon says they can get it for you. This is the best little book with which to try to understand both Machiavelli and his age. The English scholar John Hale has devoted half a century or more to the study of the Renaissance and has written the best one-volume study of the Renaissance in Europe (The Civilization of Europe in the Renaissance) that exists. Cynic, Patriot, or Political Scientist? Boston: Heath and Company, 1960. This succinct, small pamphlet is part of the Heath series, Problems in European Civilization. The whole series was excellent and many of the works are still in print but not this one. But Amazon.com says there are many used copies so it is worth the search if you want a good place to begin your Machiavelli studies. Jensen takes up the overall question of how to evaluate Machiavelli and the book includes many important articles written on Machiavelli from earlier periods, articles that still influence much of the debate. Reprinted in various paperback editions and it is still in print. Machiavelli was above all, a diplomat. His career as ambassador for the Republic of Florence unfolded at exactly the moment in which the network of international diplomacy that we all take for granted in our modern world was being invented. Much of that initial creative work was carried out by Florentine diplomats. Italy was ahead of all the world in creating and promoting an international diplomatic system. And Machiavelli was there, present at the creation. This book by the great Columbia University historian was first published in 1955 and no one has ever written a better book on Renaissance diplomacy and therefore it is still the basic text that all young historians must read on the subject. It is a model of writing: clear, concise, witty – a delight to read. And it is still in print so run get a copy quick before some fool takes it out of print. Mattingly also wrote one of my all time favorite books of history; The Armada. It is also still in print.